First published in Spanish as Espiral de silencios in 2009. English language translation by Lorena Terando published by Curbstone Books today, the 15th January 2019. 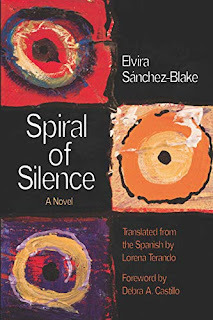 Elvira Sánchez-Blake's shattering testimonial novel, Spiral of Silence, breaks thirty-year silences about the traumatizing impact of Colombia's civil war, and centers on the experiences of women who move through hoplessness, loss, and grief during this volatile era in Latin American history. A multigenerational epic, Spiral of Silence (Espiral de Silencios) opens in the early 1980s, as peace and amnesty agreements spark optimism and hope. We meet Norma, a privileged, upper-class woman who is married to an army general; Maria Teresa (Mariate), a young rebel who loves a guerrilla fighter and navigates commitments to motherhood and revolutionary activism; and Amparo, a woman who comes of age later, and carries the confusion and dislocation of a younger generation. Each contends with the consequences of war and violence on her life; each is empowered through community-building and working for change. Few authors have considered the role of women in Colombia during this wartime period, and Sánchez-Blake's nuanced exploration of gender and sexism—framed by conflict and social upheaval—distinguishes the novel. Drawing on stories from women who have worked within organizations in Colombia to end state violence, Spiral of Silence celebrates resistance, reinvention, and how women create and protect their families and communities. In the introduction to Spiral Of Silence we learn that Sanchez-Blake was initially inspired by a tapestry she saw in a handicrafts shop in Colombia. It depicted a female figure and had been created by the shop's owner, a woman who was a leading light in the Colombian women's peace movement. Sanchez-Blake would have loved to have bought the tapestry, but it was priced far above an amount her student budget could stretch to so, instead, she returned several times to view it and to listen to stories of Colombia's recent past and the roles of women during the decades of civil war. Those stories became this novel. Authenticity shines through each of the main and secondary characters and, whether I actually liked each woman or not, I found myself easily believing in them. Spiral Of Silence encompasses all sides of the spectrum through turbulent decades and shows that women's experiences were surprisingly familiar regardless of their family's wealth or political leanings. Colombia's wars were engineered and fought by men - at one point a husband actually tells his wife 'this is a man's war' - and it seems women were expected to passively accept the all too frequent deaths of their husbands, sons, fathers, brothers, ... not expecting that their individual protests would even be heard, let alone acted upon. Sanchez-Blake focuses on three women, each of whom is illustrative of a different part of Colombian society. Through them I learned a lot more about the political situation and was strongly reminded of the myriad warring parties in 1930s Spain. A similar confusion of factions looks to be case here. This novel takes place over at least two decades and I felt as though there was some fluidity of time which could occasionally be confusing. Sanchez-Blake also frequently changes narrative focus between the women and also between first and third person. This could have caused confusion too, but I really liked the way it was done. The first person sections are generally brief and add a sense of excitement and immediacy to their scenes. I thought the translation here was excellent. Words whose meanings are pretty obvious aren't translated at all - for example comandante for commander - so we are frequently reminded that these are Latina people. As the storylines begin to converge, the atmosphere darkens considerably. We know the novel cannot end well and the ending is, for me, perfectly judged - uplifting, but also poignantly sad. I don't think I've ever read a book set in Columbia. I'm impressed by your literary travels! Interesting book with an interesting setting. Great review! Thanks Yvonne, I loved so much about this novel!